Sony Corporation’s Marketing mix or 4P (Product, Place, Promotion & Price) effectively support global business operations. The marketing mix defines how a firm executes its marketing plan and specifies strategies and tactics specific to the business. In the case of Sony’s marketing mix, these strategies and tactics are based on the conditions of the global consumer electronics, gaming, entertainment and financial services markets. The company’s diverse business operations require complex considerations in developing the marketing mix. Nonetheless, Sony maintains a marketing mix that comprehensively satisfies the organization’s needs in reaching its target customers. Sony’s marketing mix (4Ps) is based on the varying conditions of the consumer electronics, gaming, entertainment and financial services markets. The company effectively implements strategies and tactics to maintain a satisfactory share of target markets around the world. Sony’s Pictures products include motion pictures, television productions, and media networks. PlayStation units and related content are grouped under Game and Network Services. The company’s batteries, semiconductors and recording media are included in Devices. Disc manufacturing is included in Others. This element of Sony’s marketing mix shows considerable diversification of the business, in line with the business-type divisions in the company’s corporate structure (Read: Sony’s Organizational Structure Pros & Cons). Such diversification limits the effects of market-based risks. 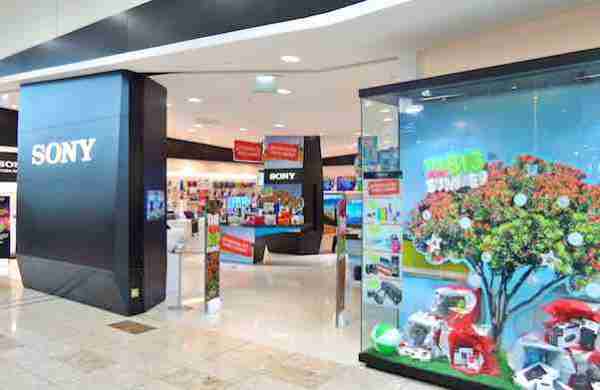 Sony Stores sell genuine products and accessories, including Cyber-Shot digital cameras, batteries and television units. These stores are also significant in promoting the brand, considering their name. The company also earns through authorized sellers, such as computer stores and smartphone stores. Motion picture products (movies) are delivered to target customers through cinemas and media networks. Sony also has official websites for devices, PlayStation content and other products. In this element of the marketing mix, Sony maintains a variety of places to distribute its products effectively and to have a wider market reach. Advertising is the most significant promotion method in Sony’s business. For example, the company advertises its products through online media and print media. In addition, public relations are used as a way to build brand awareness and enhance corporate image. For example, the company sponsors sports events, music festivals, and other events. Direct marketing is applied to establish deals with organizations that use Sony products. On the other hand, sales promotions are used to attract customers based on discounts. For instance, the company implements discounts for its PlayStation gaming products for Black Friday. Employees use personal selling at Sony Stores to persuade target customers to purchase the company’s products. This element of the marketing mix highlights activities that support the company’s market penetration efforts (Read: Sony’s Generic Strategy & Intensive Growth Strategies). The premium pricing strategy involves high prices. Sony’s products are typically priced higher than the market average. The high prices support a premium brand image, which aligns with the company’s differentiation generic strategy. On the other hand, the company applies market-oriented pricing for some of its products. This pricing strategy ensures competitiveness, based on the prices of competing products. Sony also implements value-based pricing to determine the appropriateness of some premium prices, based on actual product value and customers’ perceived value of the products. The strategies in this element of the marketing mix show the importance of high prices to ensure high profit margins and to support a premium brand image. Bahadir, S. C., Bharadwaj, S. G., & Srivastava, R. K. (2015). Marketing mix and brand sales in global markets: Examining the contingent role of country-market characteristics. Journal of International Business Studies, 46(5), 596-619. Hanssens, D. M., Pauwels, K. H., Srinivasan, S., Vanhuele, M., & Yildirim, G. (2014). Consumer attitude metrics for guiding marketing mix decisions. Marketing Science, 33(4), 534-550. Sony Global – Products, Services and Content. Sony USA – Electronics, PlayStation, Movies, Music, Product Support.